​Ivan Macbeth transcended into his spiritual body on Friday Sept 23rd, 2016 at 6:30 a.m. during the gathering. ​He expanded his consciousness into the forest, the mountains and the standing stones. The information on this page will be left here as a testament to Ivan's work. If you have an interest in Druidry please contact us. Bringing our paths together to awaken the blood, cross pollinate our teachings, build Holism, and ignite Eco/Political change. Community ritual. Sacred Land. Stone Circle. Fire Circle. Earth Healing, Intentional village. Transformational teachings, practices, and techniques led by inspiring leaders in each of these paths including Orion Foxwood, Meri Fowler, Ivan McBeth, Fearn Lickfield, and A’aylyvyne Weaverwood. 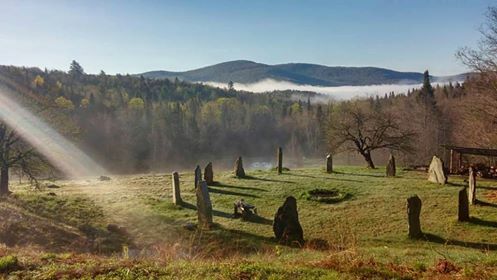 Where: This gathering will take place at Dreamland in Worcester VT; the home of the Green Mountain School of Druidry, Ivan, Fearn, Lucinda and their furry friends. Our land is a secluded, rustic sanctuary in the foothills of the Worcester Mt range. We are only 10 miles from the quaint VT capitol of Montpelier which has a large health food store, lodging and many restaurants. We have a swimming pond, a cold clear brook, a 30′ yurt, camping grounds, a stone circle called the Dragon Temple, and old sacred well in the woods, spiral herb gardens, many acres of forest, trails, and a labyrinth in the making. We encourage all who can to camp on the land in tents or cars during this gathering. This will keep our container strong and held by the land. If you are not up for this, you can look into local lodging and Air BnB’s, but please be here on time for each day’s events. We ask that participants plan to attend the full three days. ​Orion grew up with the second sight in the Shenandoah Valley in Virginia, an area rife with the folk practices of the southern and Appalachian tradition. He is a witch and Elder in Romano Celtic-Traditional Craft, High Priest in Alexandrian Wicca and teacher of the Faery Seership tradition. He is also the founding Elder of Foxwood Temple and a primary founder of the Alliance of the Old Religion, a national network of covens in his line that have united to preserve the ways of his Elders. ​He was the co-director of Moonridge, a center for metaphysical, Craft and Faery studies in Maryland. For over 20 years, he has lectured extensively across the United States and in the United Kingdom on the Craft, Faery Seership Tradition and Southern Folk Magic and conjure. He is the author of The Faery Teachings (RJ Stewart Books, 2007), a collaborative CD project with RJ Stewart named Faery Seership and his newly released book The Tree of Enchantment (Weiser books, 2008). On the lecture circuit, he is best known for his teachings on traditional second sight and folkloric Faery practices originating in the ways of the Faery Doctors and Cunningmen of Britain, Ireland, Scotland and Wales and the conjurers of the American South. In the "other" professional world, he hold a Masters Degree in Human Services, is a licensed professional counselor and a public health administrator. His teachings are based in traditional folk practices aimed at direct spirit contact for substantive personal transformation. Ivan was visited by the Bird of Freedom and entered the world of the shaman in 1974; he has been on the adventure of his life ever since. At that time he was first introduced to the writings of Carlos Castaneda, and discovered that there were people, in fact a whole culture, that experienced life in similar ways he did. He realized that he wasn’t hopelessly mad, and that his perception of life was a valid shamanic reality. He became inspired to commit himself to the way of the spiritual warrior, and introduced the techniques and training of Toltec shamanism into his everyday life. The goal of the spiritual warrior is to find Freedom - the freedom to be oneself, and to express one’s innermost being with grace and impeccability. This is a dream that touched Ivan deeply, precisely because he felt so wounded emotionally, and trapped in a world that had conditioned him to think and act in unnatural and restrictive ways. He is constantly working towards his freedom, and is happy to share his findings with anyone else that is truly inspired to do the same. He feels that the planet itself is also subject to the unnatural dominance of humans, and he works, in the creation of sacred space, to bring the magic back into world. Thus he found his healing, and so it continues to the present day. Ivan’s passion is the creation of sacred space, and stone circles in particular. 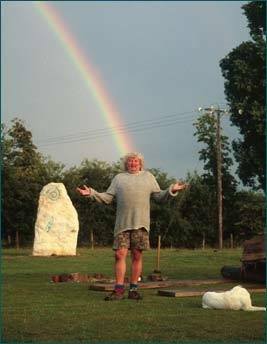 Since 1990 he has designed and built ten full-sized stone circles in various countries around the world: in the UK, North America, Canada and Australia. They include the large Swan Circle on the site of the Glastonbury Music Festival, and the Dragonstones in Surrey. Some of these large megalithic temples, consisting of stones of up to twenty tons, were built by hand over many months, utilizing only those tools used by the ancients, and focused muscle and mind power. He has trained a skilled team of stone circle builders, called The Megalithic Order of Druids, or MODs for short. He is a founder of ‘Circles for Peace’, a nonprofit making organization whose intent is to build stone circles around the world, dedicated to peace on Earth. The first Peace Temple will be built in May/June 2006 on the shores of Lake Champlain, Vermont, in the USA. At present Ivan lives in Vermont, USA, where he is exploring his New World. He is married to Fearn; they are sharing the path of loving partnership together. He teaches ongoing shamanic healing courses on both sides of the Atlantic. He loves hiking through wild and beautiful country, where he delights in interacting with the spirit of the land. He plays the dijereedoo, hurls a mean boomerang, and often wears a silly hat. Fearn Lickfield is a web weaver who facilitates the healing and connection of of people with the Heart of Nature. She co-directs The Green Mountain Druid Training and Guardians of the Sacred Earth, works as a certified flower essence practitioner, geomancer, ecstatic dance leader, community organizer, gardener and medicine maker. Being a lover of magic and ritual, Fearn co-creates community celebrations in honor of the earth and waters, the seasons and for rites of passage. Meri Fowler teaches Meditation, Shamanism and Wicca on the West Island of Montreal. Meri is the founder of the Wiccan Sacred Circle network and the Greenwood Celtic Shamanic Wiccan Tradition. Click here to read more about this Tradition. She is Initiated as a 3rd degree High Priestess by Lady Rhiannon of the Coven of High Oaks, American Welsh Tradition, has a black belt in Ninjutsu and a Bachelor of science in Nursing. She is the co-owner and founder of the Sacred Cauldron Center. A’alyvyne Weaverwood is a traditional witch and high priestess in Romano-Celtic Old Religion, and has been enraptured by the Beauty and Power of nature since childhood playing in the woods of Western New York. A’alyvyne believes in integration of her spiritual beliefs into every aspect of life and has been exploring her path in earth-based spirituality, and specifically traditional witchcraft, for over 25 years. She is founder of Weaverwood Temple, a House of the Old Religion focused on service, celebration and study of the Old Ways. In addition to her devotion to the Craft, she is also passionate about her work in faery seership and sacred beekeeping, and has taught and led ritual, as well as organizing and supporting, at various gatherings for over fifteen years. First and foremost a seeker and servant of the Old Ways, A’alyvyne lives in Baltimore, Maryland where she incorporates practices of sustainability and eco-spirituality as manifestations of her personal relationship with the Divine. She encourages a modality of joyful self-exploration, experiential revelation, and development of each Seeker as an individual manifestation of Divine Spark.